Bruce Lee, hero of our youth for many boys of our generation, grandmaster of kung fu. You could now even go further and link his skills with the one of another hero: Lee Scratch Perry, grandmaster of dub. Where?s the connection between both men? For example the longplayer ?Kung Fu meets The Dragon?, also known as ?Heart of the Dragon? from 1975 and both masters left many artists inspired. Perry and Lee are the heroes of Razoof, and regarding this they combine different styles on his longplayer ?Life, Love & Unity?, such as Roots Reggae, Dub, Pop or even other genres creating a moment that hits the spirit of the age and welcomes everyone to enjoy the music of Razoof. In this moment, there?s nothing left to do. How you feel, where you are, who you?re with, what you do and don?t is what matters ? as long as you follow the request ?be water my friend?. This moment absorbs you and you just feel yourself and the world?s beauty surrounding you: life, love, and united with the universe! Whether we?re sitting on the warm sand of a beach or chilling in a leather chair in a lounge, partying somewhere and are happy about whatever, and so forth ? doesn?t matter in such a moment. There?re just ? sounds promising, and is therefore a reason why Razoof involved many well-known friends from all parts of the world as remixers or partners in crime in the studio. Besides the neo-dub veteran and the founder of Rockers Hifi Bigga Bush, you will find the electronic duo Pluto Project & Secta Chameleon from Budapest, the founder of the first US-DubHouse label ?Worship? Rob Paine. He gave his version of ?I Just Wanna Thank God? an extra drive by using the stunning voice of Philly?s soul-icon Lady Alma. What?s more, there are also contributions by Toon & Lizzle Rendall from Sydney, the Ibiza chill out gang PM FM, New York?s dub experts Cosmic Rocker and Vienna Scientists? best kept secret Stefan Obermaier. The only restriction imposed on all producers was to contribute a dub mix to the album. On ?Life, Love & Unity? 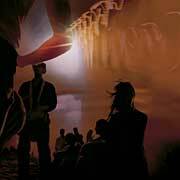 you can hear how different dub music is interpreted by people from all over the world. Since the album presents a profile of modern electronic dub sounds, from the slowed down roots dub by Cologne?s colleague Eleven55 to the forward pushing dubhouse by Rob Paine, whereas the majority of the grooves are lusher & smoother which leads to what we tend to call ?DubLounge?. 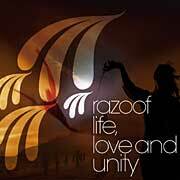 Razoof has already released on Stereo Deluxe, Jah Love Recordings and his own label ?Nesta Recordings?. He?s also a part of the collective ?Solar Moon?, worked together with German electronic-pioneer Klaus Schulze back in the 90s, and during this very decade he also participated in Cologne?s burgeoning reggae scene as a drummer (alongside Don Abi, Bantu & Patrice, Gentlemen), before he started his own more electronic focused music in 2000. In the following years, DJs like Richard Dorfmeister, Bigga Bush, Paul Murphy, m.a.n.d.y, Mr. Scruff or Rainer Trüby stuffed their cases with his (meanwhile rare) vinyls and established a good reputation as a producer of floor-suitable hits which maintain a whiff of reggae influence. ?Reggaelized electronic on a dub tip?, as he himself mentioned on his latest longplayer. Thereby, he rather sticks to the club than to the dancehall.